Mashing up writing, engineering, music, film, and friendship, we celebrated progress and new possibilities. Setting out to make a film, we realized to our own delight and surprise that in the process we had written a draft of the first half of a short science fiction novel featuring the first characters (some people, some animals, and at least one alien) to settle on Mars. The cast on Mars, who arrive there through a series of mostly isolated adventures and meet on the Red Planet, include the astronaut dogs Caesar and Rocky; astronauts Yuck Yuck and Mr Poo Poo; funny space food chef Noells; the first class of kids on Mars and their teacher; an alien named Frank who has lived on Earth his whole life but whose parents were originally from Mars; and many more. We are now preparing for our next writing and filmmaking challenge - bringing our characters together to build the first city on Mars. In discussing that challenge, we have identified a powerful idea, or writers’ message, to share: when we work together great things happen! We realized with pride that not only do the characters we have created accomplish great things, but so do we - working together to set and achieve our own ambitious goals. 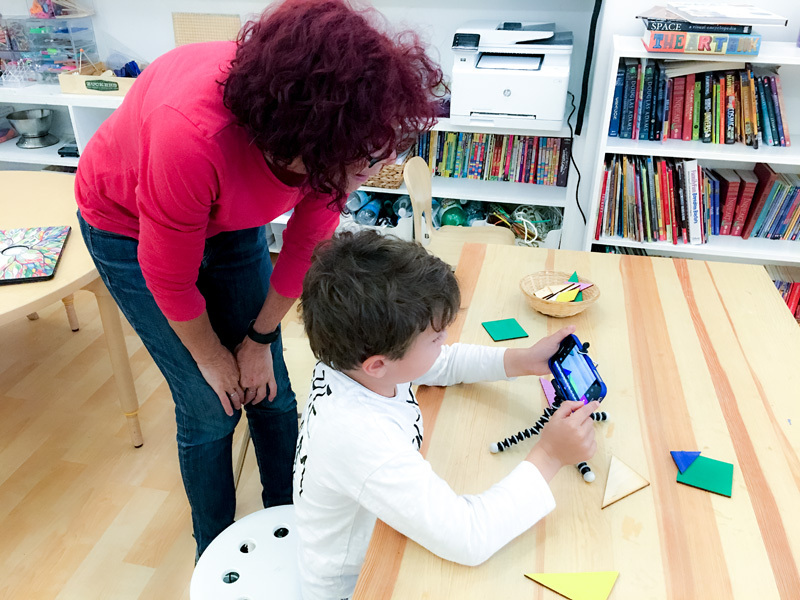 Reflecting on that powerful idea, Team Martian (students who have developed greater independent skills - mostly age 7 and above) watched a scene their teachers enacted in which we did not work well together. We analyzed how each character in the scene felt and spent time discussing ways to become better friends ourselves. Openly discussing our own feelings, we reached out to one another with empathy and care, realizing ways in which we could be more inclusive and closer to one another. Music is making its way into our program in a significant collaboration with New York University’s MuseEdLab. Two grad students from MusEdLab showed our Team Martian some of the tools from their lab. We all created a composition based on classical pieces and then participated in a design thinking activity to co-design our collaborative project with MusEdLab. We are forming a band that will compose the soundtrack of our film about settling Mars, and building musical instruments for Mars! Our team Pluto dove into musical exploration with the idea of "beat", using their bodies as the guide. We first used our hands to clap, then looked inside our bodies to feel our heartbeats moving more slowly when we are resting, and faster after dancing. For weeks we’ve been looking forward to time for personal projects and have now demonstrated the independence and technical skills to dive in. Team Martian’s projects include designing prototypes of robots operated with GoGo Boards our students have learned to program, preparing for our presentation later this month at Stanford University by building a light projector and an LED bonfire, writing a short story, making a paper airplane launcher, designing a musical fidget spinner, and designing a flashlight with sensors that turn it on automatically when you enter a dark room. 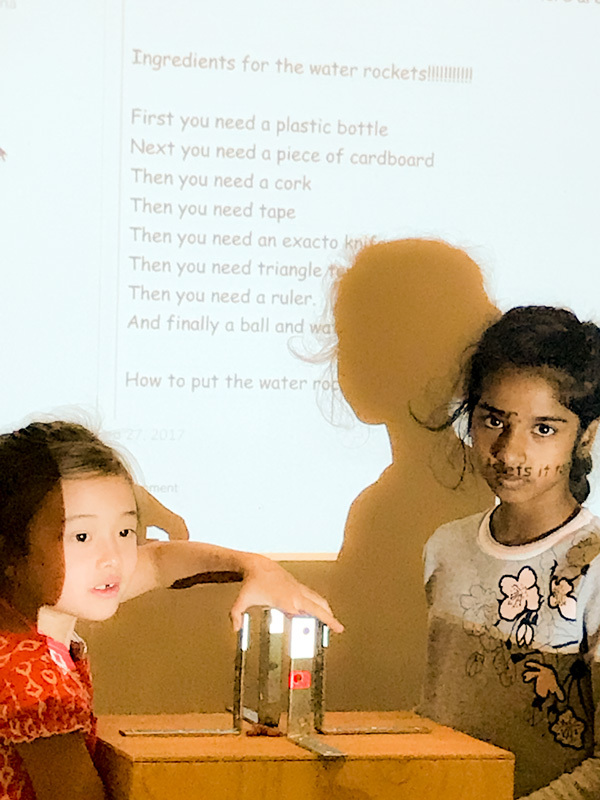 Members of Team Pluto (comprised mostly of our younger students) built sculptures out of recyclables, developing their imaginations and their making skills. 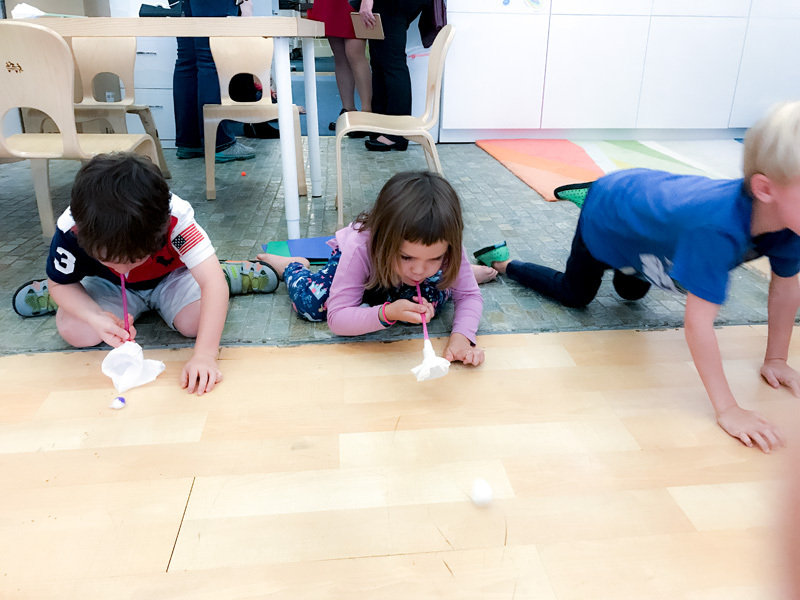 Their creations include a sailboat, shark, skyscraper, superstar rocket, airplane, and more. We loved the time to dive deep and spend time in creations of our own choosing, and are looking forward to time to continue work on our personal projects each week! You can't test a rocket launch enough! A tricky engineering challenge occupied Team Martian - determining how to attach a camera to our bike pump rocket so we can take footage of our rockets’ launches and flights. Determining that a parachute might help, we learned how to build a parachute - cutting a circle from very thin plastic, and making holes on it to attach the strings to our rockets. To prototype how to launch our rockets with cameras attached, we tested our design. We weighed the cell phones we’ll use to record our flight, and attached objects of the same weight to our rockets. We then attached our parachutes to our weighted rockets, and launched! Team Pluto (our younger students) are now getting ready to blast off to Mars in their own rockets. 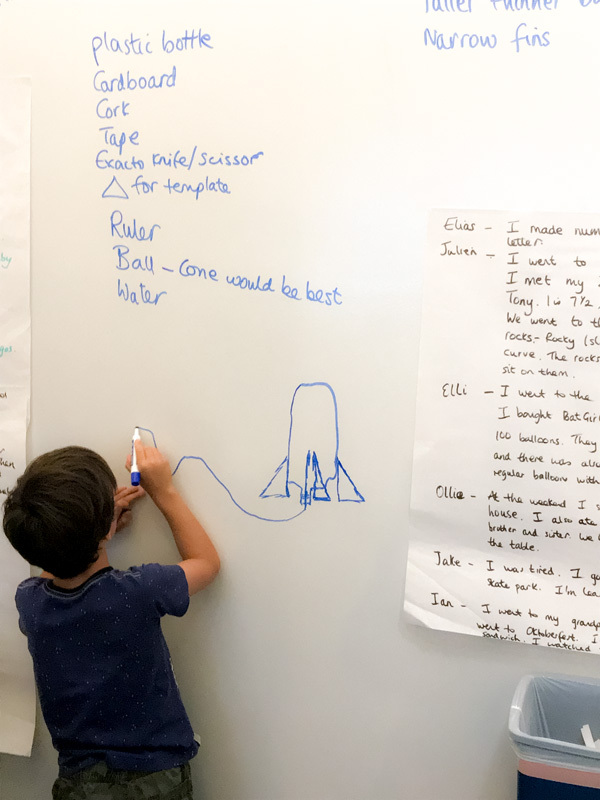 Team Pluto received support from Team Martian members to design and prototype their rockets, and next week Team Martian will help Team Pluto build and launch these rockets! Team Martian filmed our rocket launches, developing our filmmaking skills and collecting data to analyze if our parachutes work properly, how far our rockets travel, and how weight impacts our rocket design. 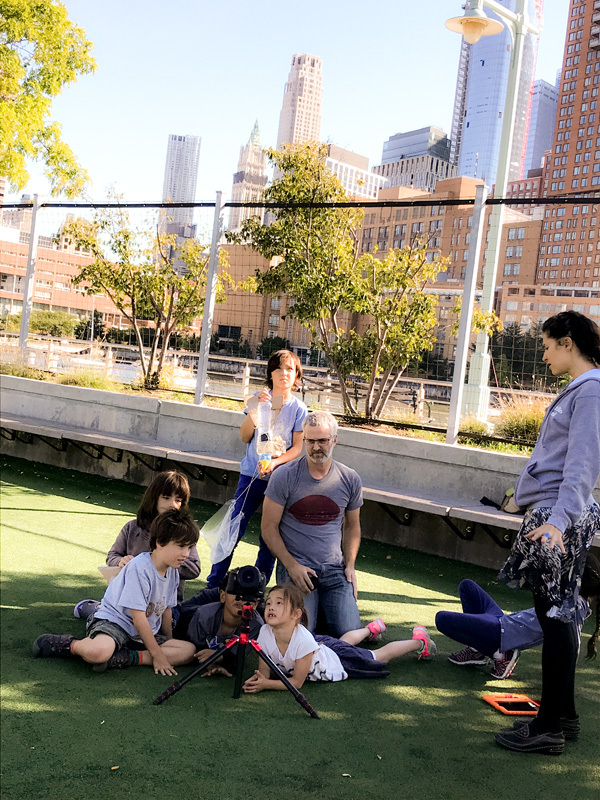 We all further developed our skills as filmmakers with artist-in-residence (and Portfolio co-founder and COO) Doug, practicing stop motion animation and working collaboratively to help each other tell our stories in a visual way. In order to make things move, Team Pluto looked at different forces and how they impact our daily lives. We were especially interested in the equipment we use during recess. 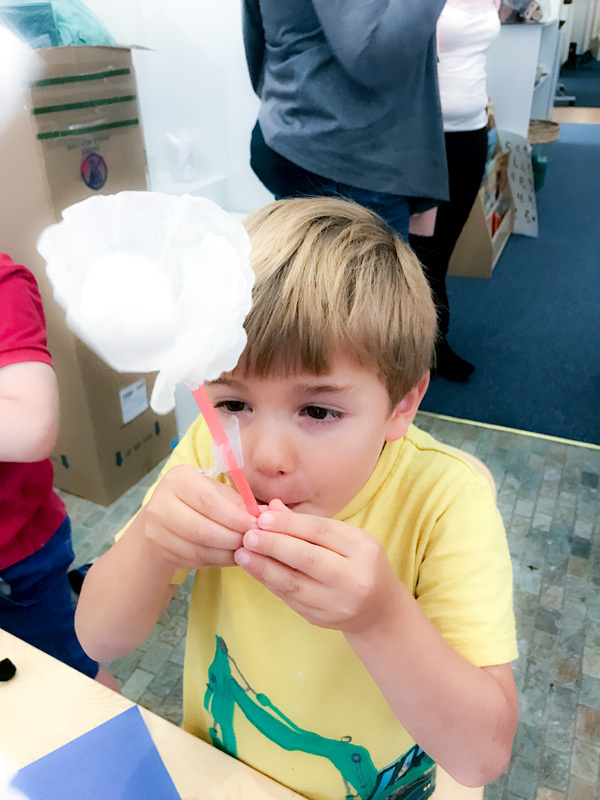 Our motion challenge this week was to make a cotton ball, pom pom, bell and dice move by only using a straw and a coffee filter. Meanwhile, Team Martian began our exploration into what gravity is, preparing to apply our understanding in our coding projects. We began by coding an animation of a collision using the program scratch, learning about control statements, how to make springs move, and what can we do when two springs collide. We will soon apply the concept of gravity in computer simulations. In addition, one of our students, Lucas has been working on his own on-line course to learn the programming language Python, and is making great progress. Our reading and math skills are improving. Team Plutos’ phonics rockets are really taking off. 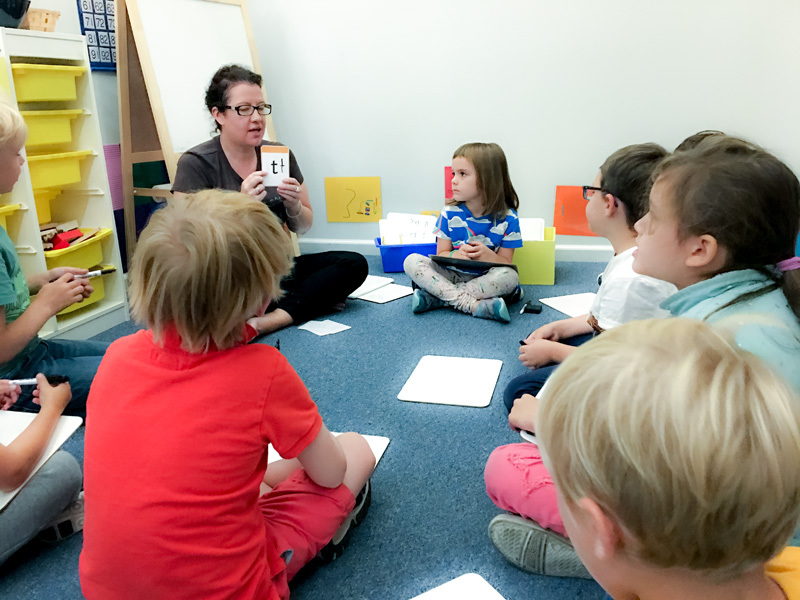 This week we added i, m, n, d to the sounds we already know, helping us make more words. Under each sound is a button and when we press it, it makes the right sound. Each of us then applied our learning reading and writing at our own level. Each member of Team Pluto has also started our own author adventure beginning with their number book and ending the week designing their first picture book. Meanwhile, Team Martian are writing book reviews of the science fiction and nonfiction books we are reading. In math, our Plutos used drills to connect the two jaws of a very hungry alligator made out of popsicle sticks. 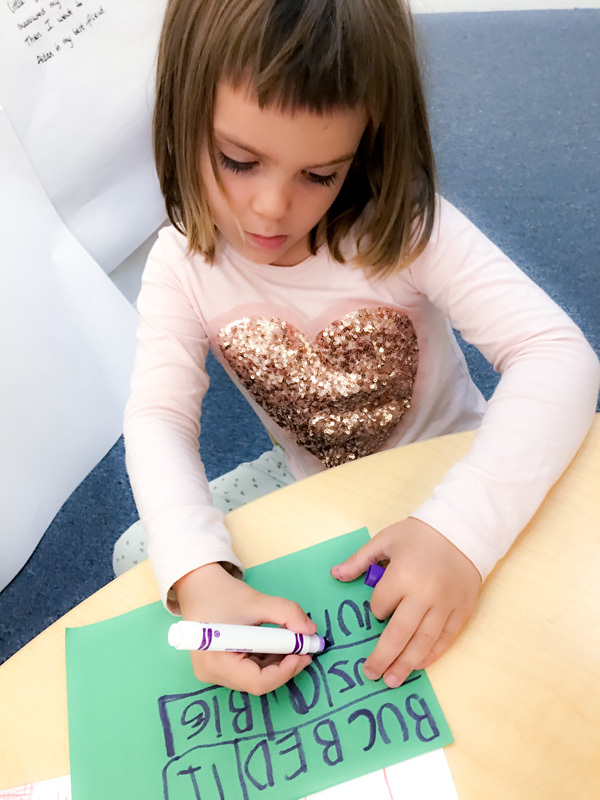 Our alligators make the signs for less than and more than, then “eating” bigger and bigger numbers. We practiced with comparing “more than”, “less than”, and “equal to” up to 20, even challenging each other to take on numbers larger than 20 with great success. Through RedBird, a program designed for gifted and talented learners and which we are using with all our students, we kept practicing math skills at our own pace. We are working on our math facts, practicing addition, subtraction, multiplication, division, and division with fractions, depending on our own level. We are playing games and applying our mathematical ideas to real world problems. We left Friday afternoon incredibly energized, excited to continue our learning, creating, and adventures! See you next week!